I recently spent a memorable evening with friends from the Jacksonville TasteCasting team at The Bridge Waterfront Bistro – a casual fine dining oasis in Ponte Vedra. The restaurant has been in operation for just under four years and seems to have struck just the right mix of beach-town casual – as befits its waterfront location, and white tablecloth elegance. In the interest of full disclosure - I am proud to call chef/owner John Cakmis and his wife, co-owner Jill Gustafson-Cakmis friends, and I've been to The Bridge many times for lunch. This was, however, the first time I had experienced dinner at The Bridge. It certainly won't be the last! We were blown away by the whole experience. Our meals were compliments of the chef, but the compliments here written are my own sincere and unbiased opinion of the food and the establishment. The chef and his entire staff clearly aim to please, and they hit the mark. Many of their employees have been with them for years, and watching them work together they seem like a close-knit family. On this evening, John and Jill both spent time with us at table, deftly juggling entertaining our party of five, and managing the busy restaurant. The meaning of the name "The Bridge" is obvious once you've seen the place. The sizable restaurant is dwarfed by the massive SR 210 bridge over the intracoastal waterway. For years this space housed a popular “fish camp” style restaurant, and even with lots of clean up / brighten up of the decor, the property still retains that rustic charm that is the hallmark of a good, unpretentious waterfront restaurant. The open kitchen is bustling, and glass cases gleam with impressive whole fish and shellfish. They’ve got a decent wine list with something for every price-point, but a popular choice is the evening’s special Sangria. There are nightly martini specials as well, and happy hour specials in the bar most nights. My favorite salad is the Fried Oyster BLT – salad greens with a spicy Caesar dressing, and tomato wedges, with a crown of applewood smoked bacon and crispy fried oysters. This dish alone or paired with a cup of soup would make a delightful and satisfying meal. 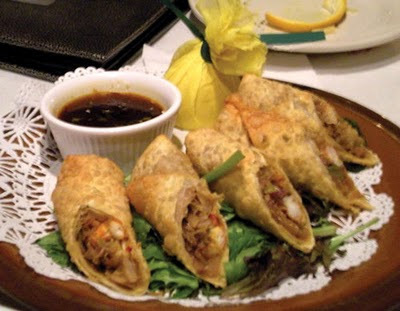 Crawfish Spring Rolls are a popular appetizer and have been on the menu since day one. Crispy wonton wrappers with a tasty crawfish filling, served with a wowza Asian dipping sauce. 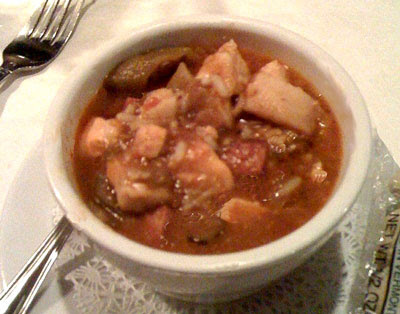 Word to the wise – not to take anything away from these apps, but if you go- save room for the Cajun Bayou Gumbo ($6 – cup $9 – bowl, $12 – entree). Full flavored, dark and delicious, this is the real deal. Studded with crawfish tail, shrimp, sausage and fresh, tender fish, if there is better gumbo anywhere in Jacksonville or the Beaches, I’ve not tasted it. 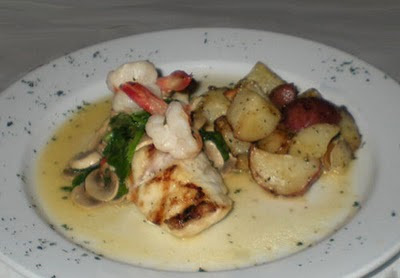 Chargrilled Grouper Eleni is topped with fresh local shrimp and mushrooms in a lemon herb butter sauce, served with roasted red potato wedges and sauteed spinach. 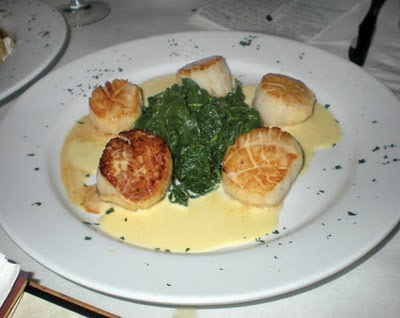 Pan seared tender sweet Jumbo Scallops are served with sauteed spinach and roasted red potatoes, topped with a citrus beurre blanc. These are on their dinner menu for $23 – and the value is outstanding. 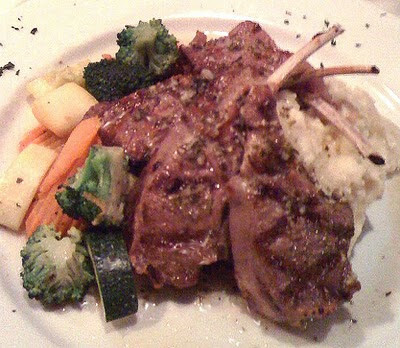 The Mediterranean influence is evident in the perfectly seasoned and chargrilled Greek Lamb Chops. ($27). 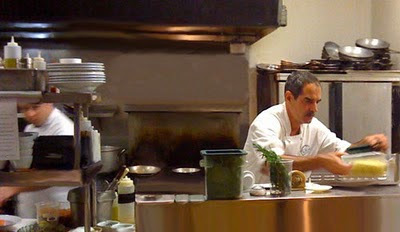 Chef Cakmis is Greek, and his Lamb Chops are one of many tributes to that heritage. His passion for his craft, his staff, purveyors, and their clientele comes through loud and clear with every word, and echos on every plate. 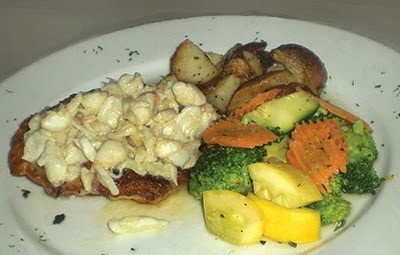 Snapper New Orleans is delicate Red Snapper (it was still legal to fish for it at the time of our visit) topped with a sizable dollop of jumbo lump crabmeat, in a lemon butter sauce with a roasted red potatoes and vegetable medley. I’ve lived at the coast most of my life, and I have never had fish so perfectly cooked. Moist, tender with the delicate flavor of the sea, this fish was so fresh and so well prepared we were literally speechless as we sampled it. Words were superfluous, but some wild tweeting was definitely taking place. This preparation is featured on the menu with Grouper – but if they have it, splurge on the Snapper. There are plenty of varieties, so if red isn’t being fished, just ask the chef to recommend a substitute – he won’t steer you wrong. 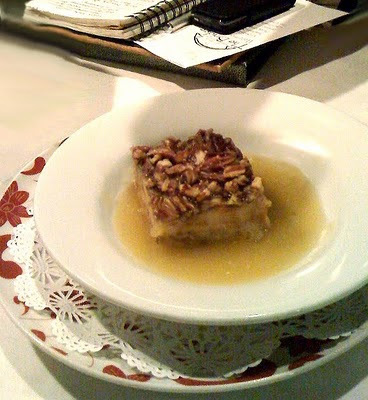 For dessert – and who knew we had room for it even – there was a humbly offered bread pudding – luscious and sweet, sitting in a vibrant pool of Whiskey Hard Sauce and topped with crunchy toasted chopped pecans. There might be other dessert options, but this is what I’ll be eating next time I go. Provided I’ve saved room that is. 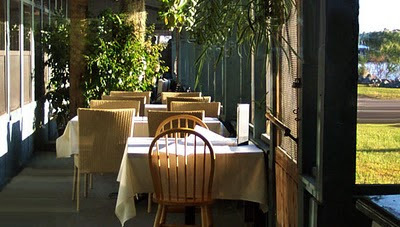 Aside from the large main dining area, there are several other little spaces tucked away – some indoor, some outdoors. 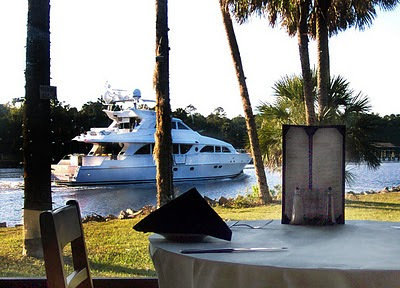 Most have a stellar view of the intracoastal and the veritable parade of boats gliding by. Our tasting was an evening event, so the water wasn’t visible but the trunks of palms lent a soft glow to the ambiance. It’s easy to lose track of time here. Before we knew it, three hours had slipped by. We were the only diners left in the previously busy main dining room. To our hosts’ credit, we were oblivious of that fact as we hung on every word, savored and shared every dish that came to the table, each more impressive than the one before. 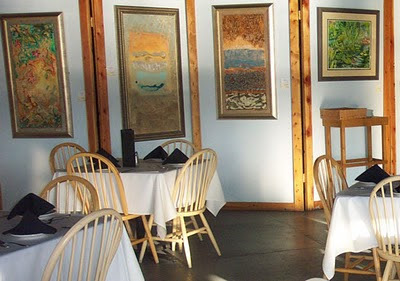 An arrangement with the Cultural Center at Ponte Vedra provides local artists with another setting in which to showcase their work, and The Bridge donates their percentage of any sales back to the Cultural Center – so diners get to view beautiful art, the local artists gain exposure with The Bridge’s clientele, and the CC at PVB benefits. 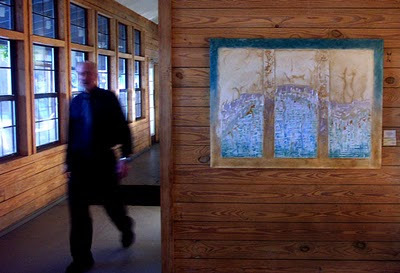 On this evening, the work of local artist Gordon Meggison graced the walls and lined the halls. It’s the type of place you want to bring a special date or tell all your friends about. There is a semi-private lounge area for private parties or meetings seats up to 30. There is plenty of room for large parties/groups, and the service is accommodating. The Bridge Waterfront Bistro may be rented out on Mondays. Tues., Wed., Thurs., Sun. 11 a.m. – 9 p.m.
Fri. & Sat. 11 a.m. – 10 p.m., closed Monday.